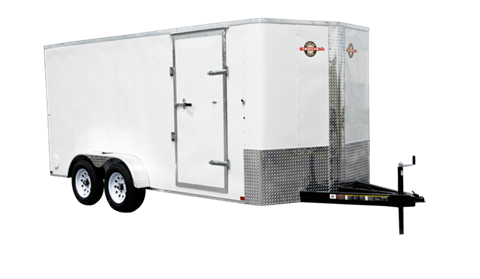 New Cargo Trailers • Cargo Trailers: Standard / Width 7 Ft. Cargo Trailers: Standard / Width 7 Ft.
2 x 6 in. Tube A-Frame Tongue. 2 x 6 in. Tube Main Frame. 2-5/16 in. A-Frame Coupler with Safety Chains. 2,000 lb. Rated Top Wind Jack with Sand Foot. (2) 3,500 lb. Rated EZ Lube Brake 4 in. Drop Axles. 205X15 Tire and Wheel Assemblies. 24 in. Frame On Center. 16 in. Wall On Center. 24 in. Roof On Center. 3/8 in. Plywood Interior Walls. Electric Breakaway Kit with Charger. Curbside Entry Door – 36 in. W.
24 in. Front Stone Guard. 12 in. Vertical Stone Guard.